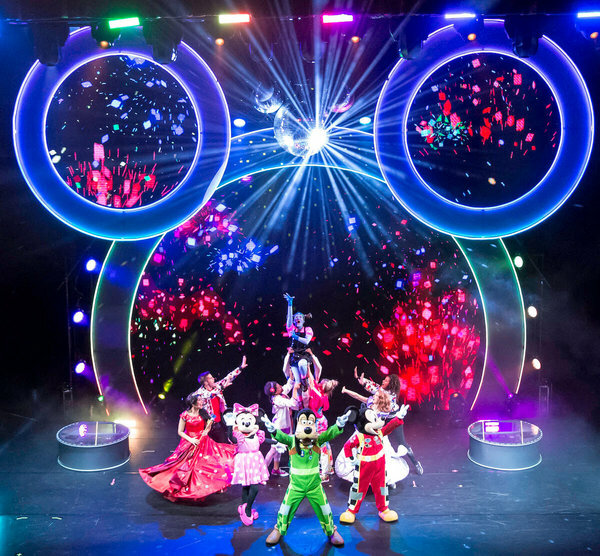 "Disney Junior Dance Party On Tour" Presented by Pull-Ups® launches tonight, March 14, at Thousand Oaks Civic Arts Plaza in Southern California and will travel the nation with over 60 shows throughout the year. The high-energy interactive tour brings the beloved characters and greatest hits from the #1 preschool television network's hit series to life in an immersive live concert experience designed for kids and families. Featuring 22 songs, including two brand new original never-before-heard songs, "Disney Junior Dance Party on Tour" incorporates live appearances by favorite Disney Junior characters Mickey Mouse, Minnie Mouse, Goofy, Elena of Avalor, Sofia the First, Doc McStuffins, as well as the first-ever live appearance by Vampirina. The show also includes special video appearances by characters from "The Lion Guard," "Puppy Dog Pals" and "Muppet Babies." All 22 songs are featured on the "Disney Junior Dance Party!" companion album available from Walt Disney Records. The digital album is available HERE. The CD will be available April 6 and can be pre-ordered HERE. Inspired by Disney Parks and Resorts' highly-popular "Disney Junior Dance Party! ", directed by Amy Tinkham (ABC's "Dancing With The Stars"), and produced by Jonathan Shank of Red Light Management, the live show experience is elevated by state of the art LED technology, a giant Mickey-shaped DJ booth, high-tech scrim screens that transport characters into the theater, 4D special effects and wristbands that light up to the beat of kids' favorite Disney Junior songs. Sponsored by Pull-Ups®, the tour also includes a 15-minute interactive pre-show countdown featuring new original song "I'm a Big Kid," written by Beau Black ("Mickey and the Roadster Racers," "The Lion Guard"), which celebrates kids' first milestones. The pre-show warm-up teaches the audience three different dance moves that will later be incorporated into the show. Then the show hosts remind parents that it's a good time to take their kids for a bathroom break before the show starts. VIP package offers include after-party and Character Greetings following each performance. For weekend show days, kids and families can enjoy breakfast with characters including Mickey Mouse, Sofia the First and Doc McStuffins. Performances during the week will include a special afternoon tea with Elena of Avalor, Sofia the First and Minnie Mouse.